Research suggests that not only did wings evolve in dinosaurs earlier than previously thought, they may have evolved merely for courtship displays. A study in Science describes three Ornithomimosaur specimens - distantly related to birds - from Canada. Both juvenile and adult specimens had evidence of downy feathers, but only an adult had wing-like structures. That suggests that wings may have evolved not for flight, but rather to aid in the quest to reproduce. The Ornithomimids - from the Latin for "bird mimics" - superficially resembled modern-day ostriches, with a toothless beak, large eyes and long legs, but they also had a long, thick tail. The new specimens were found in ancient river deposits in Alberta, Canada. 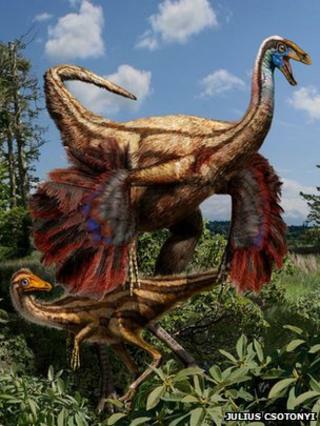 They join a number of other striking feathered dinosaurs found in ancient lake deposits in China and Germany, for which the presence of feathers is inferred by subtle markings on the fossil bones and wispy markings in the surrounding fossilised sediment. However, the new fossils come from a very different part of the dinosaur family tree. "The specimens from China that show wings are dinosaurs that are more closely related to birds," explained Darla Zelenitsky of the University of Calgary in Canada, lead author on the research. "This particular dinosaur is a bit more distantly related to birds - it's a more primitive dinosaur... it indicates wings evolved earlier than previously thought," she told the BBC World Service programme Science in Action. But what is even more striking about the specimens is that while both juvenile and adult specimens showed evidence of all-over coverage of short, down-like feathers, only an adult specimen had what is known as a pennibrachium - a structure with the form of a wing and covered in much longer feathers. "The presence of the primitive wings in these relatively large dinosaurs indicate that wings did not initially evolve for flight, and the occurrence of these wing-like structures in only the adult individual suggest that these structures were used later in life, perhaps for purposes like display or courtship," Dr Zelenitsky said. Previous feathered dinosaur fossils were found in lake regions of fine sediments and still waters that served to preserve feathers' impressions. But the Alberta river deposits are markedly different - they have much coarser sediment and would have been sites of fast water flow. Dr Zelenitsky said that opens up a great many more sites where more feathered fossils could be found, to fill in the patchy record we have of when - and why - feathers and wings came to be. Science in Action will be first broadcast on BBC World Service at 19:32 BST (18:32 GMT) on Thursday 25 October, rebroadcast at 04:32 and 11:32 BST on Friday 26 October, and will be available on iPlayer.